We’d love your help. Let us know what’s wrong with this preview of Anne of Windy Willows by L.M. Montgomery. To ask other readers questions about Anne of Windy Willows, please sign up. Why does Montgomery omit all of Anne's love letters? Do you have to read this book in order for the rest of the books to make sense? I just love seeing the woman Anne's grown into. She's finished college, runs her own little school and is in constant correspondence with her fiance, Gilbert. For the first time, we have a bit of switching perspectives - Anne in third person throughout the novel and in first person as we read her letters to Gilbert. I can see why those letters are included - it's a way for the readers to remember that she's still very much in love with her fiance. Yet, I cannot say that I'm a fan of it. It's just so eye-rollingly over-the-top. We only see the one-sided gushing from her end and nothing from his perspective. Honestly, for half of the book, I thought that was supposed to be a sign that their relationship is in the slumps. --Anne meets and befriends a new grumpy person (who becomes a bosom friend). --Anne interferes with someone else's love life (later realizing that things would've worked out without her influence). --And Anne overcomes insurmountable challenges (with grace and poise). Honestly Anne, it's a bit drab considering this book 4 and we get the same exact plot from book 1. Okay, okay...as much as I complain, I still enjoy these books. She's still the wonderful Anne that I've grown to know and love. Good night, belovedest. Your sleep will be sweet if there is any influences in the wishes of your own. Narrated by Tara Ward - an excellent reader! Too many letters & not enough Gilbert. Possibly 3.5/5 but idk yet. I still really enjoyed this book because Anne is my FAVE, but I think the back and forth between her letters to Gilbert and third person narrative was a little bit much. I didn't really love that switch and I missed Gilbert throughout this book, though I understand why he wasn't in it! I still love Anne as a character DEARLY and I will honestly love her forever. She is so kind and compassionate and lovely and just EVERYTHING. "Nobody is ever too old to dream. And dreams never grow old." I see by the reviews that a lot of Anne-fans are disappointed in this one. On this, my third reading, I must admit that I was, too. I think it is the lack of the "old familiar." Anne is away, serving as principal of a school in Summerside. Gilbert is far, far away, studying medicine. Other than letters, there is no repartee between the two. Avonlea, and her beloved residents, is only visited during the holidays and summer breaks. There "Nobody is ever too old to dream. And dreams never grow old." There are plenty of new characters, however . . . almost too many. For Anne, there are too many Pringles, the "Royal Family" of Summerside. Resenting the fact that a relative was passed over for the job that went to Anne, the Pringles seem to have organized a cabal against her. She is snubbed socially as rumors about her spread, and a virus of disobedience pervades her classroom. Luckily, Anne happens on a secret that causes the entire family to do an about face. I loved this one. I think at the beginning I was a little skeptical, especially since Montgomery kept omitting the parts where Anne "had the right pen" to write love letters to Gilbert. I wanted to READ Anne's love letters! But for all that, I loved the characters in this book. Rebecca Dew cracked me up, as did Aunt Kate and Aunt Chatty, with their buttermilk secrets; Dusty Miller the cat; Katherine Brooke; Nora Nelson and Jim Wilcox; little Elizabeth; Cyrus Taylor (oh, but that was a hilarious e I loved this one. I think at the beginning I was a little skeptical, especially since Montgomery kept omitting the parts where Anne "had the right pen" to write love letters to Gilbert. I wanted to READ Anne's love letters! But for all that, I loved the characters in this book. Rebecca Dew cracked me up, as did Aunt Kate and Aunt Chatty, with their buttermilk secrets; Dusty Miller the cat; Katherine Brooke; Nora Nelson and Jim Wilcox; little Elizabeth; Cyrus Taylor (oh, but that was a hilarious episode! )...and all those old ladies with bizarre quirks, like Aunt Ernestine, Miss Minerva Tomgallon (too much Dickens, quoth Anne), Mrs. Gibson...and of course all the Pringles! It reminded me of Rock Ridge, the town in Blazing Saddles where everyone is called Johnson. I loved the chapter with the drama club, where Sophy steps in for Jen Pringle and saves the day. Also, wasn't it great how Anne accidentally blackmailed the whole Pringle clan? Tee hee. I am pretty disappointed with this one. I mean, in comparison to the first three books in this series, this one was rather weak. Unfortunately, it just didn't keep me interested enough to thoroughly enjoy it, even if this series is reminiscent to my childhood. The writing itself was lacking any kind of interesting description, the plot was confusing and pretty much all over the place and for me, telling the story through half written letters to Gilbert, really didn't work. I do enjoy the Anne of g I am pretty disappointed with this one. I mean, in comparison to the first three books in this series, this one was rather weak. Unfortunately, it just didn't keep me interested enough to thoroughly enjoy it, even if this series is reminiscent to my childhood. I do enjoy the Anne of green gables series, and I love Anne as a character, but this little book of stories, I see to being rather unnecessary and somewhat pointless. I mean, did I really need a book crammed with unlikeable asses? I will finish this series despite my disappointment with this one. In a word....disappointing. It was good enough to finish. but it took 2 or 3 weeks to get through. This is a good indication of my interest level, because really great books keep me up at night until I finish them. This one....not so much. I didn't care for the style--half letters from Anne to Gilbert, and half third-person, with no good reason to switch back and forth between the two. There are a ton of new characters, but the sheer volume precludes any satisfying character development. Anne see In a word....disappointing. It was good enough to finish. but it took 2 or 3 weeks to get through. This is a good indication of my interest level, because really great books keep me up at night until I finish them. This one....not so much. I didn't care for the style--half letters from Anne to Gilbert, and half third-person, with no good reason to switch back and forth between the two. There are a ton of new characters, but the sheer volume precludes any satisfying character development. Anne seems to be a miracle in the life of everyone she meets, which worked okay for a book or two, but now feels like a rehashing of the same old stories with different names attached. If it were a stand alone book, I would have liked it better, but as part of a series, it felt too redundant. I. LOVE. THESE. BOOKS. Are they perfect? No. Are they very much enjoyable nevertheless? YES! I really loved Anne’s newfound maturity in this book. She’s still the young, imaginative, energetic, loving, enthusiastic Anne we know and love, but the life lessons she learned in the previous book have settled in and I really liked how grounded she was, and how secure in her engagement to Gilbert. Unlike in the previous book, there was never a time when I wanted to take her by 4.5 stars! I really loved Anne’s newfound maturity in this book. She’s still the young, imaginative, energetic, loving, enthusiastic Anne we know and love, but the life lessons she learned in the previous book have settled in and I really liked how grounded she was, and how secure in her engagement to Gilbert. Unlike in the previous book, there was never a time when I wanted to take her by the shoulders and shake some sense into her, which was very nice, indeed. I’ll also add that I once again found Anne’s kindness an inspiration. Some might call Anne a meddler, and yes, sometimes she does meddle and experiences the consequences. However, there are also times when she goes out of her way to be kind and care for individuals she barely even knows. She looks at even the grouchiest, bitterest, meanest people and tries to find something likable about them, and find a way to help them stop being so bitter and grouchy and see the beauty of the world. I can’t help but think, what if we all did that? Instead of returning cruelty with cruelty, what if we looked at even the worst people with love and showed that love to them despite their hatred toward us? The world would be a much better place. Little Elizabeth. I said in one of my updates that had things not worked out for little Elizabeth, I would have thrown the book at the wall, and I meant it! But things worked out with such sweet perfection, I just couldn’t help crying a bit out of happiness for that wonderful, dear, sweet, little girl. The storylines of many other characters, too numerous to list here. It was wonderful seeing those characters who were willing to grow and change. Oh, and while I can’t necessarily say that I *like* this, I have to give Montgomery credit for being masterful at getting me emotionally attached to characters very easily. I don’t think I can give details lest I spoil a plot point for anyone who hasn’t read this book yet, but there was one character who was barely around for, like, two pages, but Montgomery still made me cry over the individual when something happened a little later. There was also one little section of the book where I skipped a few pages simply because what was being talked about wasn’t relevant to anything. I want to be clear that what was being talked about didn’t bother me on a moral level or anything like that, it was just…Well, if you’ve read the Anne books, you know that sometimes Montgomery allowed the characters to go off on little tangents. Sometimes these tangents had relevance to the story, and sometimes it’s just silliness spewing from Montgomery’s imagination that added color to the story if nothing else. I usually don’t mind these little tangents, and read them relevant or not, but in this case it just went on too long. Anne and a local woman were walking through the town graveyard while the woman gave Anne the stories of many of the people buried in the graveyard. Out of 6 pages-worth of these mini-stories, I think only two or three of them were referenced later on in the book, so really, it was about 4 pages too much information. While it’s nice that Montgomery had such a fertile imagination that she could come up with mini-histories for so many people and communities and make them all unique, there are times I wish I could tell her that it’s okay to leave some of it out. Other than those minor gripes, though, there wasn’t anything I truly disliked about this book. It still isn’t quite as perfectly wonderful in my mind as the very first book, but I liked it better than book three, and even book two. As such, I’m giving it 4.5. Violence: Anne reads a very old journal at one point that reveals that a certain individual (who has long been deceased by the time Anne reads the journal), apparently once committed an act of cannibalism. The journal simply states the context in which it happened, nothing is described graphically, and everyone who knows about it thinks it disgusting and shameful. There is also a family in the Summerside community who is supposedly cursed, and many of its members are said to have died tragically. Again, nothing is described graphically, we simply hear that Uncle so-and-so fell and hit his head. Aunt whats-her-name had a stroke and died in that very chair, etc. Worldviews: L. M. Montgomery was clearly a Bible-reading and believing Christian given how many biblical references and biblically-based morals she sprinkled into these stories. The stories are also set in a time when it was expected that most decent, upstanding, members of society went to church, and church is mentioned from time to time, as is prayer. However, just like in real life, not everyone in the book who goes to church or “goes through the motions” of trying to act Christian actually is a believer in Christ, or behaves like true followers and lovers of Jesus should. At the same time, there are many characters who, it is clear, truly are believers and, while no human being is portraited as perfect, do try to behave as they should. Now while Lucy Maud Montgomery's Anne of Windy Poplars is considered the fourth of the Anne of Green Gables stories according to the timeline of Anne Shirley's life (and describes with both meticulously descriptive detail and often very much delightful, sometimes even wickedly hilarious humour her three years teaching at a girl's academy in Summerside, Prince Edward Island, whilst her fiancé Gilbert Blythe is studying to be a doctor), Anne of Windy Poplars is actually the second to last novel of Now while Lucy Maud Montgomery's Anne of Windy Poplars is considered the fourth of the Anne of Green Gables stories according to the timeline of Anne Shirley's life (and describes with both meticulously descriptive detail and often very much delightful, sometimes even wickedly hilarious humour her three years teaching at a girl's academy in Summerside, Prince Edward Island, whilst her fiancé Gilbert Blythe is studying to be a doctor), Anne of Windy Poplars is actually the second to last novel of the series if one looks at its publication date of 1936 (with only the sixth story of Anne's life, with only Anne of Ingleside coming later, being published in 1939). And whereas I as an older adult reader now do indeed very much consider Anne of Windy Poplars as one of my absolute and all-time personal favourite stories about Anne Shirley, I also have to admit that this appreciation and intensely passionate enjoyment has in fact come rather slowly and only after I learned to enjoy (to love) epistolary novels (for in fact, when I first read Anne of Windy Poplars as a teenager, I actually found the novel's letter-based style of textual presentation both annoying and distracting, something that I of course now no longer feel AT ALL, but something that definitely very much lessened my reading enjoyment and pleasure in 1983, when I first read or rather tried to read Anne of Windy Poplars). And as such, while I do very much and highly recommend Anne of Windy Poplars, I do feel that I must leave the necessary caveat that Anne of Windy Poplars is definitely and basically for much of the novel an account of a multitude of diversely episodic letters narrated by Anne Shirley about her various experiences teaching and living in Summerside, written by her to her fiancé, to Gilbert Blythe (who really never does make all that much of a physical appearance in Anne of Windy Poplars except briefly during the Christmas in Avonlea episode, but who is always and nevertheless at least in my opinion omnipresent in Anne of Windy Poplars as the hypothetical reader, as the recipient of Anne's letters, something that I now do absolutely love and find very if not even extremely attractive, but also something that I know many readers have in particular faulted and found majorly annoying with regard to Anne of Windy Poplars). Full (mini) review now posted! I have a soft spot for epistolary novels. I love getting someone’s innermost thoughts in their own words. This book was a hybrid, half epistolary and half regular novel. But it’s all Anne Shirley in all of her glory, enjoying a new home and profession and conglomeration of interesting neighbors. If I had to choose one word to describe this novel, that would would be shenanigans. Seriously, Anne gets into so many uncomfortable, hilarious situations, and witnesses her Full (mini) review now posted! So far, this is my favorite Anne book in the series. I fell head over heels listening to this book on audio. A cast of characters that exceeded any cast in the series so far (which is hard to believe-- I know). Anne goes to Summerside to be a principal while her betrothed Gilbert is in med school. The book is mostly comprised of letters to Gilbert about the goings-on in Summerside. Rebecca Dew might just be my absolute favorite character in the series so far. 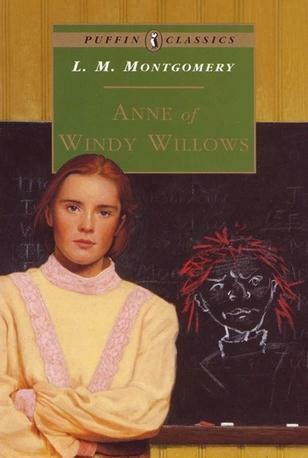 I just loved her and her snarky ways So far, this is my favorite Anne book in the series. I fell head over heels listening to this book on audio. A cast of characters that exceeded any cast in the series so far (which is hard to believe-- I know). Anne goes to Summerside to be a principal while her betrothed Gilbert is in med school. The book is mostly comprised of letters to Gilbert about the goings-on in Summerside. Rebecca Dew might just be my absolute favorite character in the series so far. I just loved her and her snarky ways. Aunts Kathy and Chatty rounded out the list of favorites. Oh- and little Dusty Miller found a place in all our hearts as the cat that warmed up even the coldest of hearts. My absolute favorite part of this book was the twins that Anne babysits-- their names had me cracking up for days! Gerald and Geraldine!!! I'm still chuckling at the thought. -- The writing was... lacking description quite a few times. It also was all over the place. I didn't see much need for the formatting of telling stories through the letters. I didn't like that too much. -- It was rather pointless... I love the Anne books and will finish the series, of course, but this was like a little book of stories I really didn't care about. There were a ton of characters. 90% of them were totals jerks so I was speed-reading most of the time. Overall, I didn't I finished it. I just adore Anne in this installment of the series. She has grown up substantially but still retains her "Anne-ness." She still gets into a bit of trouble every now and then, and she has a lovely way with words, but she's a bit less dramatic and a bit more aware of her own faults. I also enjoyed that parts of the story are told through letters from Anne to Gilbert. I love epistolary style stories, so that aspect really appeals to me. It would have been neat to see a letter from Gilbert to her, s I just adore Anne in this installment of the series. She has grown up substantially but still retains her "Anne-ness." She still gets into a bit of trouble every now and then, and she has a lovely way with words, but she's a bit less dramatic and a bit more aware of her own faults. I also enjoyed that parts of the story are told through letters from Anne to Gilbert. I love epistolary style stories, so that aspect really appeals to me. It would have been neat to see a letter from Gilbert to her, since otherwise he is so little in the story. Windy Poplars is such a cozy feeling place, and I enjoyed every moment spent there. I think my favorite character outside of Anne is Rebecca Dew, although little Elizabeth is a dear as well. After reading Anne of the Island, my favorite book in the Anne series, Anne of Windy Poplars always seems to fall a little flat for me. Anne and Gilbert are engaged and while Gilbert is off at medical school, Anne has taken a job as principal at Summerside High School. Much of this book is made up of letters from Anne to Gilbert. I just wish there was more of Gilbert in this story like maybe some of his letters to Anne. L.M. Montgomery rarely wrote much from the hero's side in her books, something After reading Anne of the Island, my favorite book in the Anne series, Anne of Windy Poplars always seems to fall a little flat for me. Much of this book is made up of letters from Anne to Gilbert. I just wish there was more of Gilbert in this story like maybe some of his letters to Anne. L.M. Montgomery rarely wrote much from the hero's side in her books, something I have always felt was lacking in her stories. This book is populated with the typical cast of eccentric and unusual characters but with the exceptions of Aunt Chatty, Aunt Kate and Rebecca Dew, I did not find them as delightful or as memorable as some of Montgomery's other creations. Anne of Windy Poplars is the book that features the Pringles but that conflict is neatly wrapped up within the first half of the book. Anne is finished at College and is now the Principal of Summerside High School. She writes to her beloved Gilbert who is continuing his education to become a medical doctor. Anne shares her experiences with the colorful and eccentric folks at Summerside. This is another charming story that will delight all readers. Please someone tell me if I'm crazy....Did Anne Shirley and a student named Lewis meet with a ghost, take a picture of him, and then when they found out he was a ghost, they took in total stride and gave the picture to his father? Did that seriously happen in this book? Or did some of my pages have LSD on them? Anne Shirley is without a doubt my dearest fictional friend. Didn't care about all the new characters, there were way too many of them and none of them stood out. They also felt pointless as it was obvious Anne would probably never hear or see from most of them again. The Summerside setting wasn't all that great either, it didn't match up to the homeyness of Green Gables/Avonlea. And when is Anne going to fully pursue her writing career? The teaching has been done to death. This one definitely isn't my favorite out of the series. It IS quite amusing, but most interesting when it's read the first time. My love for Anne is boundless. I was pleasantly surprised with this book. The format was different from the previous books, which helped greatly since Anne and Gilbert were separated during this novel. Honestly, the highlight for every single novel in this series is Anne. Anne, who is unapologetically herself. Anne, who triumphs over adversity. Anne, who is good and kind. Characters like her become fewer with each passing year. It's an awful thought, because we must all strive to be Anne Shirley My love for Anne is boundless. Coming back to this series after two whole years was a sweet, nostalgic and much-needed punch in the feels. I was sighing with contentment the minute I started it if that’s possible. This series has been an absolute delight so far. It’s so easy to be swept up in it. It’s Anne’s account of her time teaching at a school for three years and the her day-to-day life involves mostly tea parties or dinner parties and the like. And yet, the silliest of things that happen (mostly involving distant, demented and decrepit aunts) manage to sound wonderful and hysterical and entertaining because Anne is a sweet heart and her perception of life and people is endearing. As much as I love L.M. Montgomery, Anne Shirley, and creative storytelling, I struggled with this book a bit. The format was very different, seeing almost half of it is told in Anne's letters to Gilbert. Now, I'm not necessarily opposed to characters rehashing events for the reader (Tolkien does it brilliantly with Legolas in Return of the King), but it has to be done right. There has to be a good reason to hear the story from the character. I didn't feel like Anne telling these stories to Gilbe As much as I love L.M. Montgomery, Anne Shirley, and creative storytelling, I struggled with this book a bit. The format was very different, seeing almost half of it is told in Anne's letters to Gilbert. Now, I'm not necessarily opposed to characters rehashing events for the reader (Tolkien does it brilliantly with Legolas in Return of the King), but it has to be done right. There has to be a good reason to hear the story from the character. I didn't feel like Anne telling these stories to Gilbert enhanced them very much. More than that, it made some of them more confusing, as she would insert her thoughts at unexpected times. I really wanted to watch the scenes play out for myself. A second complaint I had was that this book seemed much more scattered than any of the others. Montgomery commonly inserts little episodes, adventures, and quirky characters into her narratives, but in this book they felt extra disjointed. There almost seemed to be too many characters, and there was little tying the book together as a whole. Neither did the subplots feel quite as fresh and original as some of her other books. I am happy to say (having already read it) that Book 5 returns to the old strengths. However, I did still enjoy many aspects of this book. I loved finding lines and bits of story from the movie "Anne of Avonlea." There were a lot of great lines of dialogue. I really enjoyed the character of Katherine Brooke. She was so real, she jumped off the pages. The relationship between the two widows and their housekeeper Rebecca Dew was GOLDEN (especially how they got Rebecca to stop complaining about Dusty Miller). I've said before that Emily is my favourite Montgomery heroine, and that holds. But that doesn't mean I don't have a huge soft spot for Anne and her life. She is much more domestic in orientation, at least in every book after this one, and that has its appeal. Ordinary life is painted in such vivid and interesting colours that it leaps off the page, putting the lie to the idea that such things are beneath our proper notice. Note: The rest of this review has been withheld due to the changes in Goo I've said before that Emily is my favourite Montgomery heroine, and that holds. But that doesn't mean I don't have a huge soft spot for Anne and her life. She is much more domestic in orientation, at least in every book after this one, and that has its appeal. Ordinary life is painted in such vivid and interesting colours that it leaps off the page, putting the lie to the idea that such things are beneath our proper notice. Note: The rest of this review has been withheld due to the changes in Goodreads policy and enforcement. You can read why I came to this decision here. Ok, I have loved all of the books in this series so far, however, this one was a little...how shall I say this - eh. That's what it was. Eh. Anne writes lots of letters to Gilbert, but we never get to see any letters that Gil writes to her. Also, lots of new characters are introduced in this book and I wonder how on earth Anne is going to keep up with all these people. I've been reading through the Anne series, but I decide to skip this one this time-again. Anne of Windy Poplars never interested me nearly as much as the other books, but once I finally read it, it was a really good book. Just not in the mood to read it this time. Just as amazing as others in this series? Maybe not. Just as gripping as the others? Yes! While there are parts here and there that seemed slightly unnecessary to the story, I still enjoyed this one nearly as much as her others. Montgomery fills her books with wild imaginations, quirky characters, hysterical humour, and all the while keeping with Anne's characters. The every day life is what we all experience, and this is especially presented in this book. Gilbert is only in this one briefly, bu Just as amazing as others in this series? Maybe not. Just as gripping as the others? Yes! While there are parts here and there that seemed slightly unnecessary to the story, I still enjoyed this one nearly as much as her others. Montgomery fills her books with wild imaginations, quirky characters, hysterical humour, and all the while keeping with Anne's characters. The every day life is what we all experience, and this is especially presented in this book. Gilbert is only in this one briefly, but yet, I adored that all the letters were to HIM. That actually tells me a lot about him...that he cared enough to read all of Anne's interests and crazy stuff she came across in Windy Poplars. I mean, how many guys would find dead people's stories fascinating? Gilbert, the darling that he is, must have!! One comment Anne made toward the end of the book was something to the effect that all roads lead to heaven. She was talking to a young girl, but I found the phrase slightly frustrating as there seemed to be some passion behind her words. Generally speaking, I haven't found Montgomery's Biblical stance questionable, but I didn't like that comment. There also is a part that talks about a family that was cursed and nearly everyone believes that they were. It is strange, considering all the terrible things that happened to them...and I know I wouldn't have slept so calmly in that house as Anne did!! Well...LMM does it again. Anne Shirley, once of Green Gables, has completely stolen my heart in her next adventure. Now at Windy Poplars, Anne is older, wiser, and school principal. The book is told half through letters to Gilbert Blythe and half third person narration. My only problem with this was all the love letters were excluded, and I really missed Gilbert in this book. Once Anne's competition and own worst enemy is now the love of her life. I couldn't be happier about this, because I've be Well...LMM does it again. Anne Shirley, once of Green Gables, has completely stolen my heart in her next adventure. Now at Windy Poplars, Anne is older, wiser, and school principal. The book is told half through letters to Gilbert Blythe and half third person narration. My only problem with this was all the love letters were excluded, and I really missed Gilbert in this book. Once Anne's competition and own worst enemy is now the love of her life. I couldn't be happier about this, because I've been shipping these two since she cracked a slate on his head. I felt like in Windy Poplars, Anne got what she had coming. After being a somewhat troublesome girl, she had her own set of people now causing her trouble. Between a set of twins that just wouldn't behave and Little Elizabeth next door, Anne has finally come around to the saying "children should be seen and not heard." Don't get me wrong, just because Anne is getting her karma doesn't mean she's not still getting herself into scrapes. She's ruining one's engagement while helping another to elope. She even unintentionally blackmailed a whole family. It's been several decades since I read all of this series, so I decided this year was time for another visit to them all. I'm glad I did because I'm enjoying this book so much. Anne has graduated from college and grown up some along the way - but not enough to loose her fresh way of seeing things. She's teaching at, and is principal of, a High School on PEI, but it's an entirely new community for her and not everyone loves her at first. This book covers the three years Gilbert is in medical scho It's been several decades since I read all of this series, so I decided this year was time for another visit to them all. I'm glad I did because I'm enjoying this book so much. Anne has graduated from college and grown up some along the way - but not enough to loose her fresh way of seeing things. She's teaching at, and is principal of, a High School on PEI, but it's an entirely new community for her and not everyone loves her at first. This book covers the three years Gilbert is in medical school and includes selections from Anne's letters to him. Lucy Maud Montgomery was a Canadian author, best known for a series of novels beginning with Anne of Green Gables, published in 1908. The author of the famous Canadian novel Anne of Green Gables, Lucy Maud Montgomery, was born at Clifton, Prince Edward Island, Nov. 30, 1874. She came to live at Leaskdale, north of Uxbridge Ontario, in 1911 after her wedding with Rev. Ewen Macdonald on July 11, 1911 Lucy Maud Montgomery was a Canadian author, best known for a series of novels beginning with Anne of Green Gables, published in 1908. The author of the famous Canadian novel Anne of Green Gables, Lucy Maud Montgomery, was born at Clifton, Prince Edward Island, Nov. 30, 1874. She came to live at Leaskdale, north of Uxbridge Ontario, in 1911 after her wedding with Rev. Ewen Macdonald on July 11, 1911 in Prince Edward Island. Her three children were born at Leaskdale, and she wrote close to a dozen books while she was living in the Leaskdale Manse before the Macdonald family moved to Norval, Ontario in 1926. Maud died in Toronto April 24, 1942 and was buried at Cavendish, Prince Edward Island.